For most of our lives, we look forward to our birthdays but dread getting older, and anytime I think about aging, I always flash to Billy Collins’ poem, “On Turning Ten.” He concludes the poem about turning ten years old with the realization that “if I fall upon the sidewalks of life, I skin my knees. I bleed.” For Collins’ poem, it’s a sadness the nine year old feels about aging, and for most of my twenties, I felt the same dreadful feeling as Collins’ narrator. But something changed when I hit thirty. I was on the phone today with one of my closest friends and we were sharing whines and complaints about life obligations. My friend, who is a number of years younger than I am, is feeling dismayed because she feels forced to attend an event in the circumstance of pretense. I encouraged her not to attend if she didn’t want to be there, but the fear of the judgement of others was too great, and I realized – I was just like her, once. This is the wisdom my thirties have given me, and I look forward to learning more and gaining perspective as I continue to age. For now, I hope someone in her twenties will read this and maybe take it to heart a little earlier to improve her life a little sooner. Time is our most precious commodity. It is the one item we cannot create, be sure to use it wisely. If it does not bring you joy, don’t do it. In reference to #1, life is far too short to spend your time doing something you don’t love. Don’t lie about wanting to do something by saying you’ll “try.” Yoda warns us: “Do or do not. There is no try.” And if you don’t want to do it, then be honest and forthcoming. If it means something to you, you will make the time to accomplish it. Nothing and no one worth anything comes easily. If you have a will, you will find a way, if you don’t, you will find an excuse. Take care of your body and your skin now. It all gets a little harder and a little slower as the years pass, take the extra care now while it’s easier. Spend money on things that will improve your life. Skip the new clothes and the night out at the bar, but go to Italy, buy quality shoes, get the moisturizer. There is no point in trying to waste your energy on trying to change the mind of someone who is chewing you down. Don’t get angry, don’t argue, don’t even try to sway them, just step away from that negativity and keep propelling yourself forward. Jealousy is a malignant tumor that will only destroy you. As Iago warned Othello, jealousy “mocks the meat it feeds on.” Empower others and you will find grace. Your life’s plans and goals will not always pan out. It’s not the end if they don’t work out; working towards it was part of your plan to something different. No education or experience is wasted, just have the wisdom to see how it can translate and be fluid. Money is important and a necessity, but it does not equate to a happy life. You have to genuinely be happy about what you’re doing everyday to earn the paycheck. If you’re not, start gathering ways to make it change. There’s still plenty of time to learn new things and begin new careers. The root of “career” is the Latin “carrus,” meaning “wheeled vehicle” – forever moving forward. You only have one chance to make a good first impression, and only a limited window to apologize. Do not allow arrogance to deter you from either. Friends will come and go, and only a precious few shall remain. The people who are really your friends are not only the people who are there for you when you’re down, but who are genuinely happy for your accomplishments. Finding a person who will hug and love you through your ugliest, worst moments is true love. It’s not necessarily the person you feel the most passion for, and it’s certainly not the one who brings you tears – ever. It’s the person who will tell you that you stink and need a shower while still showering you with kisses. Shaving is overrated. Get laser. What are some wisdoms you’re happy you know now and would impart to the millennial generation? We are super excited to feature a Soap of the Month Club, especially as the holidays come before us. This idea was born because, quite frankly, I LOVE getting packages in the mail. I will even go so far as to order my toilet paper online just so I can get a package. So, we thought, why not offer up a little club where soap lovers and mail lovers can rejoice and get two new bars of soap every month!? The Soap of the Month Club features a unique opportunity to sample a variety of soaps every month! We will automatically ship you two bars of soap during the first week of the month! This is such a fun and exciting gift to give yourself or a loved one! Be surprised every month with some new soaps to try! The shipping is automatically included, so you don’t have to worry about any shipping costs. We will do our best to change up the variety each month, and this club will have priority seasonal soaps! Flexible and fresh, you can choose between a Three Month Club or a Six Month Club. Soap club begins the following month from purchase (for example, if you purchase the club in July, your first shipment will arrive in August). Choose between a Three Month Club or a Six Month Club. Shipments will be sent in consecutive months (for example, if you purchase the club in July, the shipments will be for August, September, and October). Want to buy now but save for future months? Maybe you’re starting your Christmas shopping in July? No problem! Just send us a note along with your order if you want to delay your first month. We will do our best to change the variety of soaps sent each month, but repeats are possible. The fun of this club is the surprise! You never know which soaps you will receive! You may even receive special soaps that never make it to the website! You will receive an email when your soaps ship each month, so be sure to sign up for an account with an accurate email address. If you are unhappy with any particular soap, we are happy to replace a soap bar, but you must pay shipping to return the soap, and shipping for the new soap to be sent to you. You will only be billed once for this club. Absolutely NO surprise charges or automatic recurring billing. We hate that and won’t do it to you. Have confidence in your purchase. If for any reason we cannot fulfill the required month, we will contact you right away and promptly offer a pro-rated refund. We will automatically ship to the listed “Ship To” address, so please double-check that it’s being sent to the right place! Let us know if this is a gift to someone in the notes section, and give us his/her email address so we can send him/her an awesome email letting him/her know how cool you are for sending this amazing gift. Bryan Maes, the wise, witty, outspoken owner and founder of Inspiration Studios in Liverpool, New York, has been shooting photography for 25 years. After receiving his master’s degree, he originally planned to teach high school English, but realized his true calling was always with photos. Digging through Maes’ Facebook page, you’ll find a quote which embodies his strive for social reconstruction through his art: “I picked up a camera because it was my choice of weapons against what I hated most about the universe: racism, intolerance, poverty” by Gordon Parks. I had been following Bryan on social media, especially Instagram, for a while, and noticed that he has a keen and astute eye and aptitude for portraits, weddings, and landscape. Though it didn’t seem like he did much product photography at the time, I was too in love with Bryan’s work not to ask him if he would take our photos when we rebranded the shop. You could imagine my thrill when he agreed! Bryan has been taking our photos since February, and will continue to be our #1 photographer for his talent, his professionalism, his humor, his timeliness, and more. Kristen: When and how did you get into photography? Bryan: Someone, and I cannot remember who, gave me a 35mm camera shortly before I went on a field trip to the zoo in 2nd grade. I spent the whole time taking pictures of the animals and I’ve been hooked ever since. 25 or so years later, I still have that 35mm sitting on a shelf in my office. Kristen: What is your vision and/or objective when shooting pictures? Bryan: There are a lot of objectives and I think the first and foremost has always been to create a quality product that my clients are happy with. The second is to make art that I’m proud of. If I just make the clients happy that’s not so bad, but the stuff I consider truly successful does both. As far as vision goes it’s so varied depending on the job. Sometimes I’m looking to make a statement, sometimes I’m just creating something pretty. Kristen: What are your favorite photos to take? Bryan: I do a lot of different types of photography but my favorite is portraiture. There’s something about combining lighting, posing, and angles to make people look their best that appeals to me. I like to make people feel good, and who doesn’t love a picture where they look great? Portrait Photography Copyright Bryan Maes of Inspiration Studios. Added with permission. Kristen: What is key to being a good photographer? Bryan: There are so many answers to this question. I think the most important of them is never stop learning. I’ve been at it a long time and I try new things constantly. I believe that the moment you stop evolving is the moment your work stops being relevant. Kristen: What do you like about taking maker-photos? Bryan: I like people who create things. I think making person’s product look the best it can look is an interesting challenge. I love finding props and creating the still life setups that really showcase a product. Kristen: What can you do for a maker to propel his/her business? Bryan: I don’t think it’s any secret that good photos sell products. We live in an increasingly visual world and most people won’t even read the description of a product unless it looks good in the photo. Kristen: When you take pictures for Bath, Body, and Candle Moments, what is your goal for the viewer? Bryan: The ultimate goal is to sell products so I always have that in mind. Beyond that I try to photograph the products in a way that alludes to the lifestyle surrounding them. I try to match the photo thematically to the name and usage of the product so the viewer has a more complete vision. There are a lot of different soaps on the market so I try to evoke the Bath, Body, and Candle Moments experience. Product Photography by Bryan Maes of Inspiration Studios. Duel Copyright: Bath, Body, and Candle Moments and Inspiration Studios. Kristen: Has trying any of our products inspired a photo session for the items? Bryan: Actually yes, I smell or burn the candles to decide what to do for their photos. Sometimes reading the label is enough but sometimes I need more of a vision to decide what to do. Kristen: How far have you traveled for your photography? Bryan: I spent a large portion of my career traveling and taking portraits. I have worked in 48 states. Living in Upstate New York, I guess the farthest was San Diego. Kristen: What about nature inspires your photos? Bryan: I love to explore, I’m fortunate to live in a beautiful place surrounded by hundreds of waterfalls and hidden glens. My taste in outdoor destinations definitely influences my photography style in that I like things that are grand and beautiful but simultaneously intimate. Landscape Photography Copyright Bryan Maes of Inspiration Studios. Added with permission. Kristen: What is your absolute must-have tool for success? Bryan: Aside from the obvious answer of my cameras, I’m going to answer this in the abstract and say my customer focus. I put the customer first in all things and always try to view everything from their perspective. I’m constantly looking for ways to make the transaction as efficient and beneficial as possible to the customer. Kristen: What inspired you to be an entrepreneur? Bryan: I felt that my career had reached it’s limit working for other people. I wanted to expand and I wanted the freedom to do things my way. When you are part of a company in the artistic world they want everything to look the same. I simply wasn’t content with producing the same product as everyone else. Kristen: How do you support small business? Bryan: I have a simple rule, If I can buy local I do buy local. I apply this to everything from banking to groceries. Community is everything and small business contributes to community in a way that Walmart and the like never will. If you haven’t already, contact Bryan Maes of Inspiration Studios for maker photos, product photos, landscapes, portraits, weddings, and more. Growing up in Brooklyn, New York, the transition to Staten Island, New York was much more difficult than people could imagine. From an outsider’s perspective – I wasn’t moving that far away, it’s still within New York City, and I was moving to a grassy knoll out of the concrete jungle. But the culture was so incredibly different. In Brooklyn, it was absolutely commonplace to hang-out on the “stoop,” as we called it. Everyone in the neighborhood would just sit outside or walk over to another neighbor and just talk, drinking coffee, to the wee hours of the night. There was no shortage of kids to play with; we were always outside, getting dirty, making up games, ringing each other’s doorbells. Brooklyn kids have a seemingly innate and astute ability to talk to all the right neighbors while maintaining a discerning distrust of strangers. The first thing I noticed when I moved to Staten Island at 11 was the pristine lawns. We all had a front yard, with grass! But no one was ever outside. When people did go outside, it was only to water their lawns; no one spoke to one another. People didn’t even spend time in their backyards. I remember thinking, even at 11, how so much space pushed people further apart. From that transition, I developed a distaste and anger for Staten Island. I’m generally an introvert, but I sincerely missed people. I missed casual small talk and a neighborhood who watched over all the kids. I made it my point to go away to college. When the beginning of student loans took over, and the insidious precipice that I would need to now support myself came to fruition, I had to move back in with my parents in Staten Island. I went kicking and screaming, but surviving on Ramen noodles was not the life I imagined. Suddenly, my newfound worldliness from college drove me to a greater rage against this “foreign” island. To me, everything seemed so small and ignorant, everyone was so stuck in their ultra-conservative ideologies; I felt like I was being forced into some Twilight Zone episode that transported me to the Mississippi River with Huck and Jim. This disgust burned in my veins even further when I found my first teaching job in Bay Ridge, Brooklyn. I found myself staying late and spending my working hours in the neighborhood, just not to return to my forsaken island. And then a teaching job opened up in my dream school, my alma mater, which was my one saving grace as a teenager; I loved, and still love, my high school. My whole life was back on Staten Island, but none of my friends were. I crept into a dark place of work-home, with the first escape being when I met my husband, Frank, who lived in Long Island. I quickly spent every weekend out there. When we finally got engaged, we decided it would be best to live on Staten Island, for the financial reason that my job was located there, and Frank would be looking for a new job upon his imminent graduation from business school. We found a cute little townhouse apartment in a quiet cul-de-sac in Richmondtown. After settling in, I noticed something; there were kids playing outside, there were neighbors sitting on their stoops. We made idle chat, complained about the rules of the community pool. Something was changing. Then Frank and I started Bath, Body, and Candle Moments and we found ourselves at numerous vendor shows across Staten Island, networking with other small businesses and talking to local customers. We created bonds with local charities and established relationships with local venues. We found like-minded people, interested in rescuing animals, interested in natural skincare, people who cared about preservation of community and the environment. I started exploring different neighborhoods, and taking advantage of the incredible preservation of history afforded to Staten Island. I built a relationship with Patricia Salmon, Staten Island Historian, and started reading all of her books. I now spend my thinking time visiting the Alice Austen House, and because it’s within walking distance of my home, I’ll just walk through Historic Richmondtown. As I spend my time in these places, and making connections with different people, I feel a sense of pride for all Staten Island has to offer. After living here for over twenty years, I have finally found my home. So I’m about to break the rules. I’m about to reveal secrets that most women I know have, but keep it secret out of diplomacy, grace, sophistication, and everything else that goes along with being a classy and professional woman. I’m breaking these rules as part of my homage to the #HEREIAM campaign. The campaign is centered around body image, but I want to make it broader; I want to give women a true voice and break down the oppressive rules which dictate that all women are supposed to be gentle, humble, and the worst of all – moderated. We don’t love wedding and baby showers. We love weddings and babies, but not having to go to these parties. Why? Because it just vilifies anyone who cannot afford an expensive gift by forcing the poor bride/mom-to-be to sit there and open gifts. Plus, the games are always super cheesy, and the parties are just generally boring. We are secretly hoping you cancel plans on Friday and/or Sunday night. By the time we finish working all week, running the kids around, and just taking care of life, we are exhausted on Friday night and just want to spend the night on the couch. And Sunday night, come on, that’s when Game of Thrones and the Walking Dead are on TV, plus we have to get up for work! Please just make plans for Saturdays. After the age of 30, the Instagram selfies need to be cut down to once a month or less. Seriously, girl, you are smart and sophisticated with so much more to offer than a selfie that highlights just enough of cleavage to make it “seem” like that wasn’t the intention. We think your adult children should not be on your holiday cards. The only people who really love these cards are grandparents, not anyone else. It’s awkward to hang up pictures of your adult kids on our fridge. Send us the babies and the dog! Sometimes we lie about “missing” your phone call. Truth is, we don’t want to shut off the TV, or step away from our computers, or stop playing the game on our phone. We can catch up over text message, and then meet for coffee. Long phone convos are reserved for when we can really concentrate, and that’s rare. We don’t always invite people over because our house is a mess and we’re embarrassed. Most of us are juggling so many different tasks that cleaning can often be put on the back-burner, and we really don’t want you to see how we don’t have it together. We think you should be spending more time eating your meal and exercising than posting it on social media. This is different if you’re running a fitness/food site, a truly unique meal, or if you just finished your first marathon. But please, save us the daily breakfast-lunch-dinner and “I walked for fifteen minutes and did 10 squats” posts. We actually prefer shopping alone. There’s some idea that women need to always have a partner when we go shopping, but we really rather spend our time looking at what we want for however long we want. Tagging along with #8, we generally relish our alone time. Yes, we love our family and friends, but we love the time we can spend lighting a candle, taking a bath, and cozying up to a book without anyone interrupting us. We secretly all love shoes because they are adorable no matter what size you are. There are no ridiculous body image rules about what kinds of shoes thin, fat, tall, short women should wear; we love them because they’re forgiving and unbiased. We don’t buy subscription boxes because we care about the latest trends, or what celebrities are doing; we buy them because we miss getting meaningful and traditional mail. Sometimes we are being humble just out of politeness. Sometimes we really know that we’re actually amazing. I recently read a blog post by Donna DeRosa of Donna DeRosa Coaching which discussed her inspiration to become an entrepreneur through her father’s example. Her blog sparked a light in me that I had to write the story of my inspiration. I am writing this story for multiple reasons: 1. I am so proud of my family and the values they have instilled in me, I want to share it; 2. I know that if you have an idea burning inside of you, I want you to believe you can do it, because you can. If you asked me about my Aunt Pat and my Uncle Chez, I would say they have been my second parents. They have always been nothing short of absolutely present. Every stepping stone in my life, from childhood through now, my aunt and uncle are evergreens. Beautiful people, inside and out, they go above and beyond for their family and community, and while I could continue to gush about just how much I love them, this story is about how they have filled the American Dream and inspired me to become an entrepreneur. My uncle Chez (Cesare) Perfetto immigrated to the United States from Italy around the same time as my mother’s family. Coming from humble means, my uncle’s father worked as a lumberjack and farmer, and Chez was always fascinated with the heavy equipment. By the time my uncle was 16 years old, balancing school, family, his side job as a landscaper, Cesare spent every free waking moment he could learning everything about construction, and of course, the beautiful machines. At 22, Cesare married his long-time childhood sweetheart, my aunt Patricia Picchiello, and together they decided between opening a business or owning a home. With the help of his parents, who took a loan out on their home to assist, Cesare purchased one small machine and a truck. Hard work and perseverance were ingrained in his Italian heritage, and Cesare never stopped; there was no job too small for him to dismiss, and in 1985, in Borough Park, Brooklyn, Perfetto Excavation was born. On September 11, 2001, while working on a project on Manhattan’s West 77th Street, the fateful moment of attacks on the Twin Towers happened. Quickly springing into action, Cesare contacted the Port Authority and office of former Mayor Guiliani, and rode down, with his loyal laborer force, and any equipment he could, to the rubble. They spent 3 weeks voluntarily cleaning up debris, and searching for survivors. In October of 2012, when the city faced the destructive forces of Hurricane Sandy, Cesare and his employees voluntarily spent 2 months cleaning up debris. They lent the New York City Police Department light towers to work through the night to ensure public safety. Pumping out basements, helping people recover from Red Hook through Garretson Beach, anywhere former Brooklyn Borough President Marty Markowitz needed help, PCC eagerly assisted. Fast forward to today, 31 years later, Perfetto Contracting Company, Inc., was awarded the American Institute of Architects (AIA) Top Ten Environmental Project Winner for their work on Bushwick’s Inlet Park District Headquarters and Comfort Station. PCC was awarded this $17 million project in 2010 by the NYC DPR. The project included the construction of a three story LEED Platinum certified comfort station with a green roof. PCC was also responsible for the constructing all site utilities and a waterfront park. They are one of the largest and top contracting companies in the tri-state area, employing hundreds of people, including dozens who have been with them for all thirty years. Together they built an empire. Together they have inspired Frank and I that we could open Bath, Body, and Candle Moments – a seemingly far cry from construction, but the idea of building and creating from scratch, something useful, powerful, and meaningful, to help people and the community – this is what has inspired us. My Aunt Pat and Uncle Chez are remarkable people because they have never lost sight of their dreams and their family. They are our inspiration that with perseverance and fortitude, anyone, no matter what your background, can become an entrepreneur. Oatmeal has long been revered for being a heart-healthy food – low in cholesterol, high in fiber, filled with amino acids, and a complex carbohydrate, it’s no wonder your grandparents have been telling you to eat your porridge for centuries! I personally love a good old fashioned plain bowl of oatmeal. I love the smell, the texture, and I like to added a teaspoon of local honey (from Beezy Beez Honey), and sometimes I throw in some organic chia seeds for an extra boost of protein and fiber. But even by itself, oatmeal is a super-food, and all of the internal benefits are multiplied when you use oatmeal as a cosmetic. According to Dr. Joseph F. Fowler, Dermatologist: “Use of oats in skin care has been documented as far back as 2000 BC. Oatmeal is one of the few natural ingredients to receive recognition from the US Food and Drug Administration (FDA). In 1989 the FDA recognized colloidal oatmeal as a safe and effective ingredient, and in 2003 the FDA approved colloidal oatmeal as a skin protectant.” We use colloidal oatmeal in our Salt it Off Shea Body Scrub to especially cater to sensitive skin types. It has been stated that oatmeal may even offer benefits for those who suffer from acne! 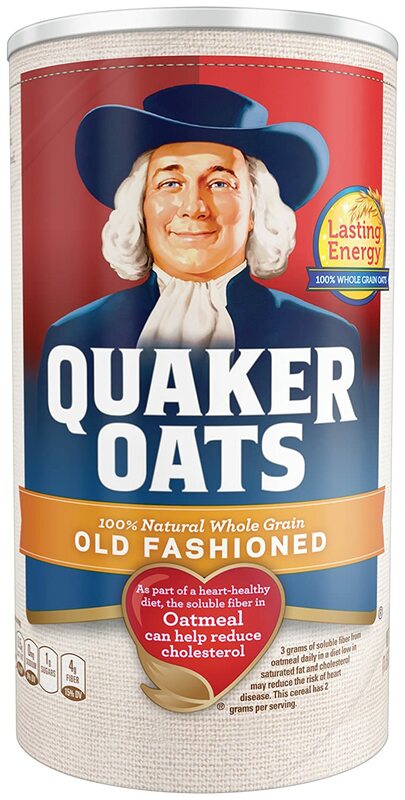 The FDA also states that oatmeal “temporarily protects and helps relieve minor skin irritation and itching due to: rashes, eczema, poison ivy, poison oak, poison sumac, and insect bites.” With so many options for temporary skin-care irritations, it’s no wonder people have been using oatmeal for millennia. With oatmeal producing so many physical as well as internal benefits, it’s no doubt that it should be a product you look for in your daily routine, especially if you suffer from sensitive skin. We will be adding different forms of oatmeal to many more of our future recipes to enhance their skin-loving properties and ensure you are reaping all of the benefits of our natural environment. What are some of your favorite ways to use and/or eat oatmeal? Please share below! A question I often receive from new customers is: “What is a body butter?” The name certainly does sound strange, and believe it or not, I have had people at our vendor shows ask me if they could eat our body butter! Well, of course you can’t eat the body butter, but the high-quality ingredients we use are all food grade. I personally love the terminology of “body butter” because the word “butter” has the connotation and implication that it is something edible, adding to the idea of its purity. But that’s not really what the “butter” aspect means here; it’s because body butters are usually made of different botanical butters. So what IS a body butter? A body butter is a body moisturizer used topically for cosmetic purposes of softening the skin. What’s the difference between a body butter and a body cream? Body creams are usually very thick in texture, with a heavy viscosity. Butters are usually whipped, where creams are not. Butters are light and fluffy, and depending on the ingredients used, are very easily absorbed in the skin. What’s the difference between a body butter and a lotion? Lotions are emulsified waters and oils, meaning lotions are a combination of water and oil, which is often why you will find glycerin, preservatives, and emulsifying wax as ingredients on a lotion. There is nothing wrong with these ingredients, as they all can be vegan, and any good lotion must have a preservative to ensure mold and bacteria doesn’t grow – Where there’s water, there are microbes ready to spawn. Body butters, on the other hand, are strictly made of oils and butters. There is no water, thus there really is no need of preservatives, glycerin, or emulsifiers. Is there a benefit to body butters over creams and lotions? It’s truly all a matter of personal preference. When created properly, they can all reap wonderful benefits to the skin, and they all really require the same type of product care. We like to create butters because we personally love the light and fluffy texture, and we feel that there is a greater value to the concentration of oils. You’re buying pure moisturizer instead of additives, so a little bit of body butter can go a long way. For example, our 1.5 ounce jars, if used every day on one large body part (let’s say legs), can last you for 4-6 weeks. Can I use body butters on my face? This depends on your skin type and the ingredients of the body butter. Our base ingredients are mango butter, coconut oil, shea butter, jojoba oil, and apricot kernal oil/sunflower oil, then scented with essential oils. We craft our butters specifically for body and facial use, as we only use essential oils in our two main butters, Confidence and Butter Me Up. Why do you use those specific ingredients? Each ingredient we choose in our body butters has a purpose. The mango butter (which is a FAVORITE) has a lot of unsaponifiables, which makes it a super effective emollient and humectant – meaning it keeps water in the skin. Coconut oil is simultaneously moisturizing and slightly drying; this allows the skin to gain a softness without a greasy feeling. Shea butter is renowned for its moisturizing properties. Jojoba oil is a remarkably rich, luxurious, non-comedogenic oil, meaning it provides great smoothness and moisture without clogging pores. Apricot kernal oil and sunflower oil are both also excellent non-comedogenic moisturizers, providing light and fluffy softness, making the butter very whippable. We pride ourselves on using only botanical ingredients, making our butters completely vegan. When is the best time to use a body butter? We recommend using body butter after a shower, especially after using an exfoliating scrub, which opens the skin up to absorbing more moisture. For the face, we recommend using it at night after washing your face for the evening. A super pro-tip for extra dry feet – Use the body butter on your feet after taking a bath in the evening, and then wearing cotton terry-cloth socks overnight; you’ll wake up to super-soft pedicure-level feet! Do you have any advice, tips, or testimonials from using body butter?